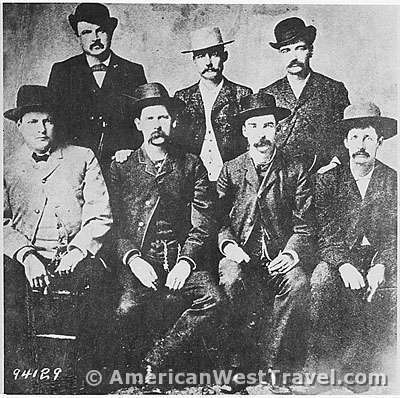 The shootout was essentially the culmination of a feud between the Earps who represented "law and order" in this lawless boomtown, such as it was, and the gang known as the Cowboys, a loose association of cattle rustlers, gunslingers, and other hard men. 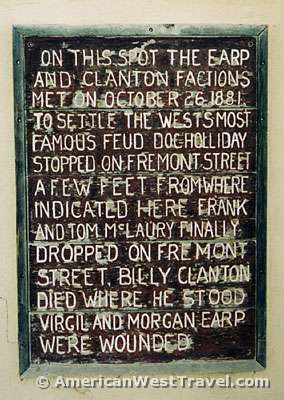 The Clantons, McLaurys, and Billy Claibourne were part of this faction. Given the nature of the town and the harshness of the Earps, there was considerable sympathy for the Cowboys. 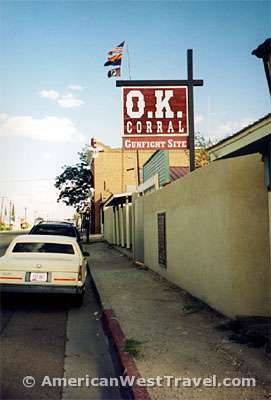 The actual shootout took place on the afternoon of October 26, 1881, at the rear of the O.K. 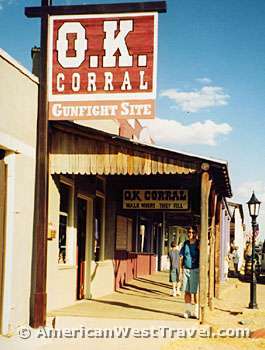 Corral (left) on Fremont Street. Doc Holliday and the Earps (Wyatt, Virgil, and Morgan) rounded 4th Street (near tree in photo), and approached the Clantons and McLaurys who were standing at the corral. Town Sheriff, John Behan, tried to intercede but was shoved aside by Virgil. The Earps were supported by Mayor John Clum and Judge Wells Spicer. After Spicer ruled the deaths as justifiable homicide, the Cowboy Gang went on a campaign of terror. Mayor Clum's stage was ambushed at night but he survived. 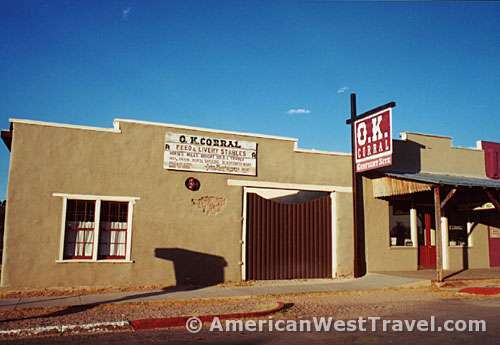 Virgil Earp was also ambushed, on December 28, 1881, and permanently crippled. On March 18, 1882, Morgan was shot dead while playing pool. At this point, Wyatt earned his reputation as a gunslinger during his "vendetta". He and his associates hunted down and killed several members of the Cowboys implicated in the attacks on his brothers. The most startling story, supported by alleged witnesses, involved "Indian Charlie". When he was found and confessed his guilt in Morgan's murder, Wyatt allowed "Indian Charlie" first draw, before filling him with lead. When charges were filed against Doc and Wyatt for the killing of Frank Stilwell, both left Tombstone for good. The photo, (right), comes from the National Archives of the United States. Taken around 1890, the picture posed past and present "Peace Commissioners" of Dodge City (Kansas). Left to right: Charles Bassett, W.H. 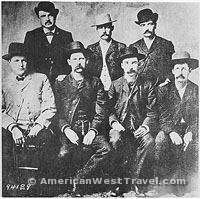 Harris, Wyatt Earp, Luke Short, L. McLean, Bat Masterson, and Neal Brown. Masterson was a close friend of Wyatt and spent much time in Tombstone before returning to Kansas in 1882. Luke Short, another friend, and part-time lawman and part-time gambler, spent time in Tombstone and left a victim in Boothill. Most of the hard men of Tombstone did not live long or prosper. Billy Claibourne was gunned down in 1882. 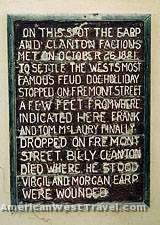 Ike Clanton was shot to death in 1887, resisting arrest. Johnny Ringo, the gunslinger who was Wyatt's chief protagonist, was found dead in 1882 with a bullet in his head. The death was ruled a suicide but many people think the bullet came from Wyatt's gun. Doc Holliday finally succumbed to his tuberculosis in 1887 at age 35. Virgil Earp, crippled by the ambush, died in 1905. 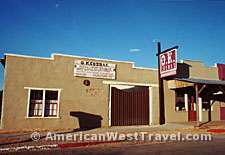 Wyatt Earp eventually moved to Los Angeles and lived a conventional life as a businessman. He outlived all his contemporaries, dying on January 13, 1929, at the age of eighty. He was therefore able to tell his version of events in Tombstone without being contradicted. Thus, the legend was born.